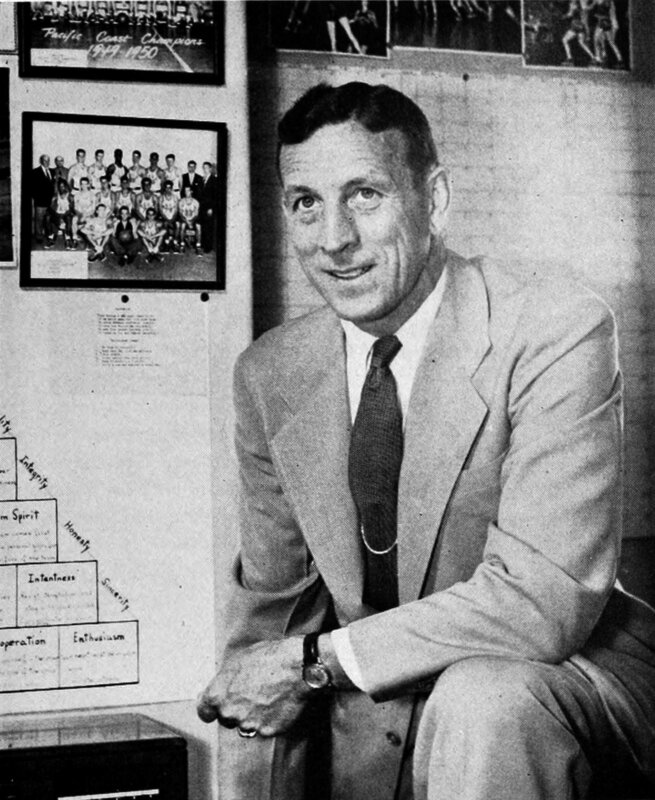 Coach Wooden had a vision! Where are we going, and what kinds of practices will best help us get there? Such questions fundamentally test our knowledge of the demands of our sport. In the rest of this article, I hope to offer some ideas and examples to help a coach answer these questions. In doing so, I will explain how to create a performance model; how to devise a curriculum; and how to create activities for the curriculum. The exemplars I provide throughout the article are from level 6 sports coaching students at Leeds Met who have done first class work. Recent ‘hot-off-the-press’ research from colleagues into the characteristics of ‘serial winning coaches’ suggests that establishing a ‘vision’ is extremely important for any successful coach. Having vision involves the ability to simplify complexity (for most sports are very complex); to use simplified models to predict what future elite performance will look like; and to create coherent plans based on this understanding. Let’s look at each step in turn. The first step is developing a mental model, which involves understanding the ‘internal logic’ of your sport. In order to do this, following Bernard Suits’ analysis of games, we need to understand the goals and rules of our sport. This helps us to see the fundamental ways in which rules prevent us from reaching goals by the most efficient means, and the tactical problems that emerge as a result. A really easy way to appreciate this is to think of a major rule change in your sport and the tactical changes that happened afterwards (e.g. the introduction of ‘back court’ and 24-second shot clock in basketball and subsequent tactical need to push the ball much faster up the court and create a quick shot). By thinking about the ways in which rules and goals conflict, it is possible to map the main tactical problems that emerge in a sport. Next, we need to consider the techniques required to solve the tactical problems. I use an example from boxing, as a very simple and ‘elemental’ sport (Goal: knock your opponent out. Rule: hit them above the belt whilst standing). This is clearly a very simple example, but it show how we can start to understand sport as a complex of goals and rules, which produce tactical problems that can be solved by the efficient execution of particular techniques. So far, we have not found a sport that cannot be analysed and understood in this way. This is the ‘simplifying complexity’ part of the ‘vision’. Now we must envisage future elite performance. Building on the mental model, all that is required now is to describe what target performance looks like. In the boxing example, we could watch lots of elite boxers, in a division of choice, and start to describe how they solve the problems and execute techniques suggested by the model. We could also look for statistics and ‘analytics‘ from our sports to help with this process. Technology such as Prozone and Hawkeye can provide insight into how the best football teams keep the ball, or how the best tennis players return serve, respectively. In the boxing example, consulting analytics tells me that Floyd Mayweather Jr evades about 70% of his opponents’ punches, making for effective counter attack. So, combining our own observations with relevant analytics can help develop a vision for what model elite performance will look like (see descriptions below, in red). EXAMPLE: James Bishton has created a very detailed and well-researched mental model and performance model in football. 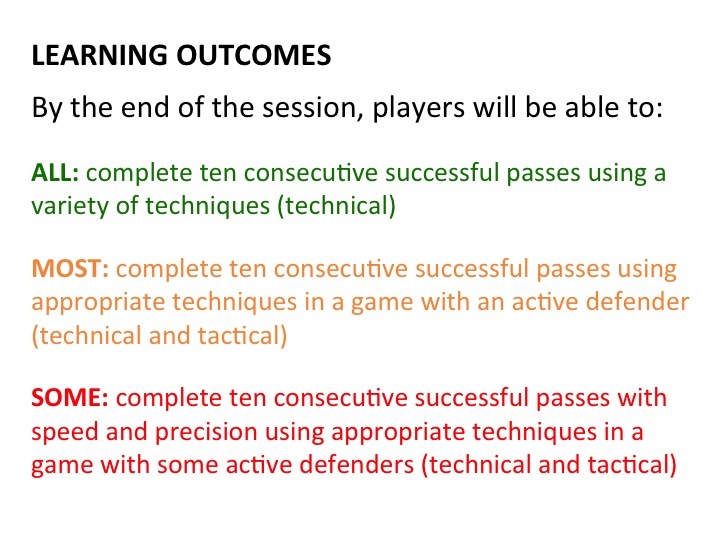 Should be very useful for any coaches doing their UEFA B license! Once a coach has developed a “vision” – based on a personal tactical and technical mental model and performance model – they are in a strong position to create balanced and specific curricula. I have already written about the idea of a ‘spiral curriculum’ elsewhere in this blog, so will not repeat this in detail here. Suffice to say, the principle of a spiral curriculum is to start with the selection of Fundamental Recurring Themes (FRTs) that are important enough to return to in increasing depth, again and again, through the development pathway. The FRTs you choose could well be the core tactical problems or principles of the sport, as set out in the mental model. The really challenging and time-consuming part of the process is translating the descriptions of target performance from the elite level down to specific ages/stages. There is no obviously easy way to do this, other than to observe young athletes at different stages and try to make informed and logical judgements about what to expect a young athlete to be able to do and understand as they progress towards target performance. In invasion games, for example, it is logical to develop an individual defensive/guarding position and movement (stage 1) before working up to 2v2s and 3v3s (stage 2) and then onto team positioning and defensive rotation (stage 3). 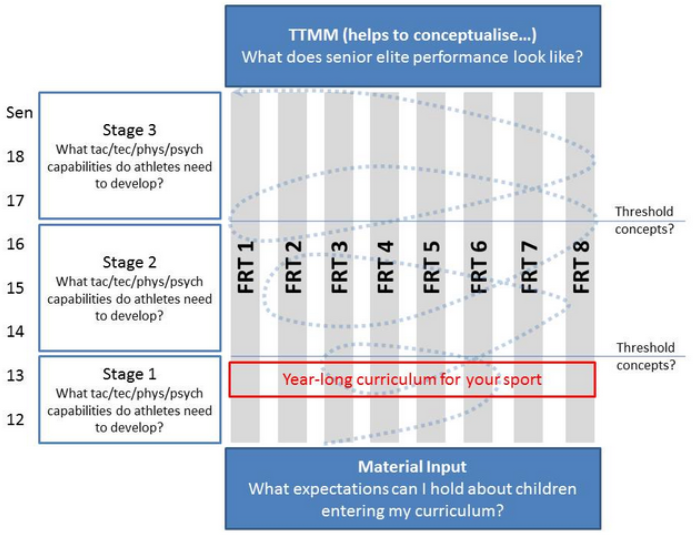 Many sports and national federations have adopted some form of the LTAD model that can help conceptualise expectations at different ages and stages. 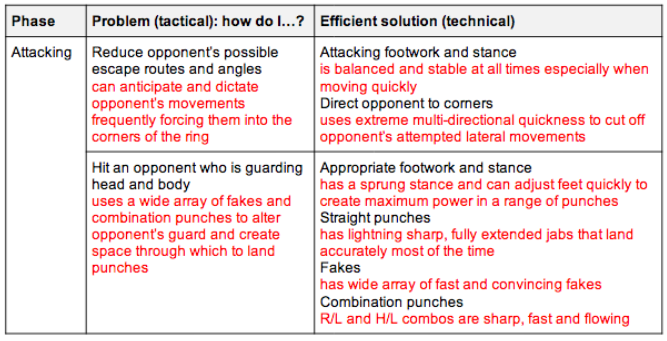 Coming back to my boxing example, Boxing Canada have produced a useful document that helps us determine certain tactical, technical and physical expectations of developing athletes (pages 34-48). Using such documents in tandem with your own observations can help to create reasonable and aspirational yearly targets. Some sports have even created award schemes (gold, silver, bronze) against which to monitor progress of athletes, which can be great motivational aids, if used in the right way. EXAMPLE: Rory Barton has done a great job of creating an age/stage curriculum for 9-12-year-olds in wakeboarding (link to Prezi). If the preceding steps have been followed carefully, the development of annual (macro), phase (meso) and session (micro) plans should be simple! If we have clear written expectations of our athletes at each year or stage, our annual plans simply involve deciding how much time (or how many sessions) to dedicate to each ‘theme’. It is then important to write “learning outcomes” for each phase or session: describing in detail what the athletes will be able to do by the end. Good learning outcomes, like good goals, need to be specific, measurable and achievable. If you can write differentiated learning outcomes (see below), even better! The final step of creating or choosing appropriate activities (returning to the question posed at the very beginning) should then be obvious. Put simply, we need to create games, drills and practices that allow athletes to meet the learning outcomes. In the example above, it is easy to imagine some dynamic possession games with varying degrees of defensive pressure and numbers to create appropriate learning opportunities for all levels. In our experience, coaches become very reactionary to results during a season and quickly depart from carefully laid plans. There is no good reason to do this at a developmental level, so it is important to stick to plans and maintain a good balance between, for example, attacking and defending tactics and technique. Game sport coaches, for example, often neglect defence and off-ball play, even though most players spend more than 90% of the game without the ball! Again, our students created very useful examples showing how to translate broad age/stage curricula into session-level outcomes and activities. EXAMPLE: Sam Glendinning created a very coherent model, curriculum and annual plan for young tennis players (link to PowerPoint). EXAMPLE: Andrew Burke created a clearly balanced season’s worth of session plans for junior football players (link to PowerPoint). I would like to conclude the article by thanking the students – James Bishton, Rory Barton, Sam Glendinning and Andrew Burke – for the permission to use their work. We have learned from experience that creating a performance model (establishing a ‘vision’) and turning it into a specific and balanced plan is not easy. If it were, sport federations and coach education programmes would teach coaches how to do it (they don’t), and the web would be awash with examples (it isn’t). I hope, then, that this article helps to provoke some coaches into action, creating their own models and plans that I encourage any readers – in the spirit of our students – to share. This entry was posted in Management, Organisation and tagged Curriculum, Internal logic, LTAD, mental model, Performance model, Planning, Vision. Bookmark the permalink.